You are here: Home / Jewelry / Brooches / Two fabulous blue and yellow brooches from 1940. Two fabulous blue and yellow brooches from 1940. Our first blue and yellow brooch is this gorgeous, simple, abstract piece made in 1940 by the esteemed Van Cleef & Arpels. This beauty was made in France and is titled “La Flamme.” I liked its dynamic shape and vibrant colors right away, and once I saw the name and realized it’s meant to evoke the blue/yellow heat of a lick of intense flame, I loved it. It’s all sapphires: 10 yellows, totaling approximately 9.50 carats and 30 calibré-cut blues weighing approximately 4.00 carats. Blue and yellow brooch #2 is this fabulous piece. It’s actually from the same year, 1940. It’s as figural as the previous brooch was abstract. The elegant hand is made of gold, with ruby cabochon fingernails that utterly blow my mind. 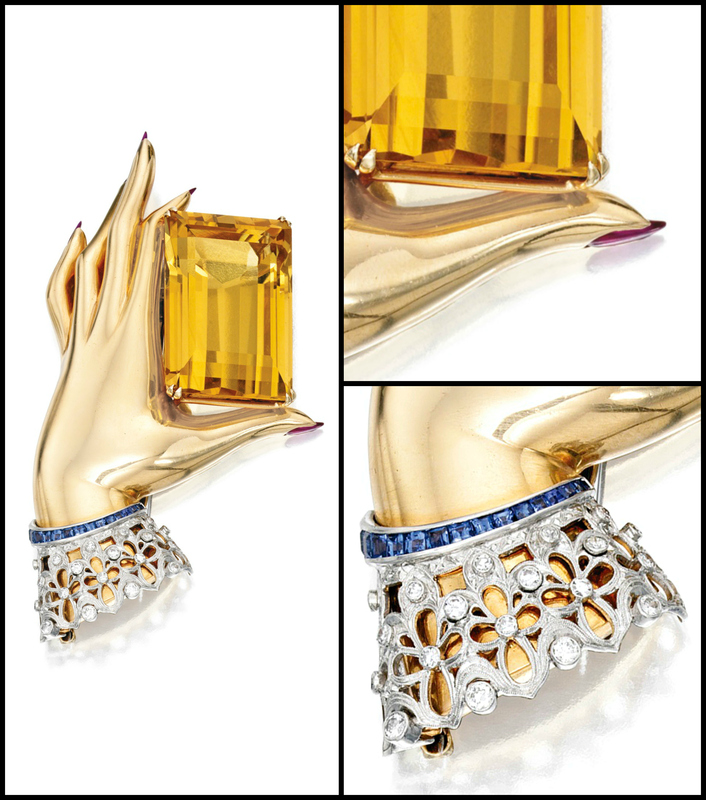 The hand – which delicately pinches a 100 carat citrine between golden thumb and forefinger – disappears at the wrist into a delicate lace cuff detailed in diamonds and calibré-cut sapphires. The catalog notes compare the design of this second brooch to the work of Paul Flato, but this particular piece is not attributed to any specific maker. What do you think of these two beauties? How would you wear each of them? 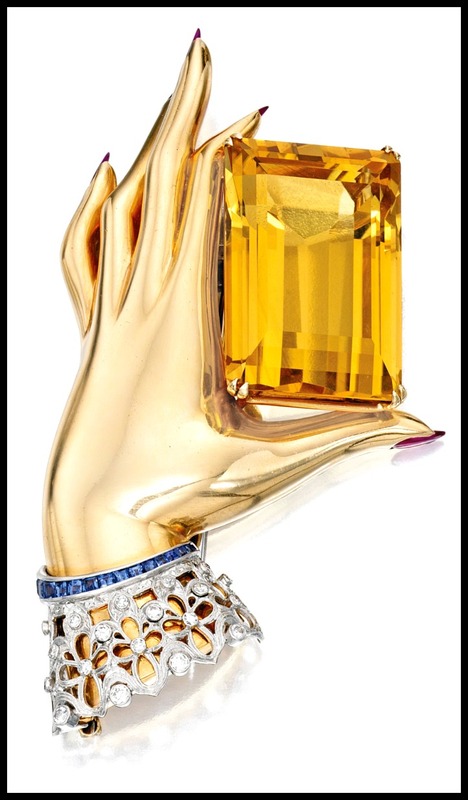 I picture La Flamme as being amazing on a sash, whereas I think the citrine hand would be best glowing boldly on the lapel of a solid-colored coat. These blue and yellow brooches were both listed in Sotheby’s auctions. Please see individual descriptions for source links. All images and info are thanks to Sotheby’s.